THE patent maximalists want the unreasonable. They want to turn what’s public into private monopolies (e.g. publicly-funded research into patents) and then enjoy immunity from the Patent Trial and Appeal Board’s (PTAB) inter partes reviews (IPRs), even when such private monopolies get traded away with patent trolls that sooner or later tax the public. “They want to turn what’s public into private monopolies (e.g. publicly-funded research into patents) and then enjoy immunity from the Patent Trial and Appeal Board’s (PTAB) inter partes reviews (IPRs), even when such private monopolies get traded away with patent trolls that sooner or later tax the public.”Moreover, the patent maximalists want to make companies accountable abroad (outside the US) for infringement of US patents as judged by US courts, as per Western Geco v Ion (see our remarks on this decision). The patent maximalists are to science what the NRA is to public safety. IPO now celebrates Western Geco v Ion in a new “IPO Webinar on Damages”. IPO’s aggressive lobbying for software patents has been covered here many times before; notice this webinar’s leaders; Microsoft’s ‘former’ Bart Eppenauer (now Shook, Hardy & Bacon LLP) is among them. What bothers us even more is the vanity of patent maximalists, who insist that they should be writing everybody’s laws so as to enrich patent maximalists. This is corruption, but they rely on ‘proxies’ like politicians and pressure groups. Mind Watchtroll’s latest headline, speaking about needing to “[r]estore the patent system” (restore? It was never gone!) 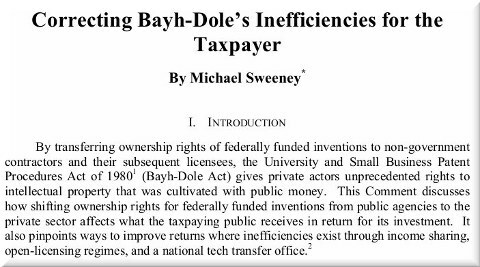 and “protect Bayh-Dole” (a subject covered here before, e.g. in [1, 2, 3, 4]). That’s next week. Notice how only patent maximalists are speaking and attending. The hallmark of lobbying; they try to dominate the system and control the entire dialogue/debate about it. We see the same in Europe whenever or wherever the Unified Patent Court (UPC) gets discussed. Watchtroll is quite revealing; it’s a lot more blatant and rude than the other patent maximalists. Only yesterday it resumed its Federal Circuit bashing, as we have noted a few times lately. It’s also smearing SCOTUS over its rulings, not just PTAB (not anymore). They are, at present, attacking just about anything, even the former Director of the USPTO (whom they tried to remove from her job). It’s disgusting to watch and this is why we end up with such an ugly system, where the prime goal seems to be granting monopolies on every single thing. But the dynamics of the patent system have changed in recent decades. Public health activists have filed lawsuits stating that, rather than increasing access to technology, patents create monopolies that make good health unaffordable and inaccessible for many. In 2013, a coalition of patients, health care professionals and scientists challenged patents covering genes linked to breast and ovarian cancer at the US Supreme Court. They argued the patents had led to expensive and poor-quality genetic tests available only through one company: Myriad Genetics, the patent holder. This article was later reposted a few times by Government Technology, under the headline “An Early Expression of Democracy, the US Patent System Is Out of Step with Today’s Citizen”. The US Supreme Court’s treatment of patentability in recent times has often been frustrating to life sciences innovators, with last month’s refusal to grasp the nettle of patent eligible subject matter in Cleveland Clinic Foundation v True Health Diagnostics being the latest setback. However, the highest court’s recent grant of certiorari in Helsinn Healthcare v Teva Pharmaceutical is a silver lining for inventors in the sector – creating the prospect of greater certainty on the rules surrounding prior art and novelty under Section 102, an issue which is of great importance that has been thrown into confusion by recent developments at the Federal Circuit. The US Supreme Court isn’t overturning Alice/Mayo. In fact, it doesn’t even look into anything remotely like Alice/Mayo. Another patent maximalist, Dennis Crouch, states the obvious, in an effort to slow PTAB down and defend bogus patents, having already attempted to twist the Constitution to influence Oil States and make PTAB obsolete. Is Dennis Crouch trolling the Patent Trial and Appeal Board (PTAB) on July Fourth? Hard to tell, but these people haven’t given up on the plot to abolish PTAB/IPRs. Crouch recently did some 'marketing' for Thomas Massie, now backed by and promoted by patent maximalists like Kevin E. Noonan (McDonnell Boehnen Hulbert & Berghoff LLP), as expected. He probably paid to push this into Google News etc. as can be seen here. This was originally mentioned by Patently-O, which promoted it as one can expect (it’s a patent maximalism think tank). What we deal with here is basically a coup attempt; they’re writing the wishlist of the litigation ‘industry’, dressing that up as “Restoring America’s Leadership in Innovation Act.” It’s a pro-software patents, anti-PTAB bill (one of many, all of which have failed). New patent legislation would rectify some of the damage done by several court rulings and by Congress. “No, it won’t pass,” I told him. It’s just one of many failed efforts, going back almost to Alice (2014). It’s another shot in the dark. It’s being promoted by a patent troll, Dominion Harbor. That says a lot about who’s looking to benefit — the very antithesis of “innovation”. Today, the Computer & Communications Industry Association submitted its comments opposing the Patent Office’s proposal to change the claim construction standard applied in AIA trials from the current broadest reasonable interpretation (BRI) to the Phillips standard district courts apply. Here is the document [PDF] in question. Maybe it’s time for technology companies’ front groups to publicly explain what a ludicrous bill Massie put forth, serving nobody but the litigation ‘industry’ under the guise of “innovation”.